From decoration to functional rugs, we are the experts in this niche of home décor. Available in a large variety of colors and fabrics, these rugs are sourced from the most popular rug-making locales in the world. Try these to and see how they add to your home’s overall décor. From ornate rugs to those that are slightly outlandish and those with intricate details, our portfolio of area rugs continues to swell. You can find rugs for all the main purposes—softness for the underfoot, soundproofing, temperature insulation, and as embellishments for your living space. From designer rugs of 20th and 21st century to those that make sense for high-traffic surfaces of departmental stores, ours is the most comprehensive online collection of rugs. Choose from an array of outdoor and indoor rugs, small and big rugs, stair tread and silken rugs and pick the best option for your kind of décor. 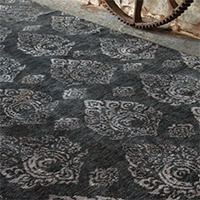 You will find many options combining contemporary rug-making technology with traditional methods. From hooked to tufted, from flat weave to Embroidered, and knotted & woven rugs, we sell them all! Area Rugs There are 314 products.